Before I started with lessons for my PPL (Private Pilot License) I was extensively using Flight Simulator and two Macedonian airports - Ohrid (LWOH) and Skopje (LWSK) were among my most popular airports. In past years I visited Macedonia several times for business. Last year in July during my stay in Skopje I was working together with a boy who was a paraglider and knew some people who knew guys from Aeroklub Skopje. One day after the working hours this boy gave me a ride to the airport and I hired a flight instructor for about 40 minutes. The airplane was Utva produced years ago in former Yugoslavia. After the flight I joined fellows from Aeroklub Skopje and we had a long discussion in one of nice Skopje’s bars, drinking excellent Macedonian beer “Skopsko”. So that was the time I found many new friends and then I was a regular visitor of the airfield Stenkovec near Skopje. This year I had several business opportunities in Macedonia, however, none of these turned to be a real one. Therefore I decided to make a business visit to Macedonia and join this with my vacancies trip to Island of Mljet in Croatia. Me and my wife departed from Divača on July 4th 2008. Traveling to Croatia requires official crossing of Schengen border. As the closest international airport in Portoroz (LJPZ) was already closed I decided to fly to Trieste airport (LIPQ) which is about 20 minutes flying away from my home airport Divača. After clearing the customs we had a very nice flight to Dubrovnik (LDSB) where we landed about 15 minutes after sunset. Next morning we had a boat connection to Mljet island. Mljet island is a beautiful island with only one hotel and thus not with many tourists. On the north-west part of the island there is a national park, which prevents further development of the island. We were staying in village Polače which is known by the nautical tourism. The whole stay there we had very nice weather and extraordinary warm sea water – about 26-28 degrees of Celsius, so staying in water for more then two hours was no problem. On Sunday, July 13th we departed from Dubrovnik airport to Ohrid (LWOH) in Macedonia. The route was: LDDU – TIBRI – TAZ NDB – POD VOR – RETRA – MAVAR – LWOH. After departure from Dubrovnik I contacted Tivat approach. I had to circle before TIBRI point for about 10 minutes because there was an airplane departing from Tivat (LYTV). This was pretty unusual for me as I was already about 5000 feet high. Usually you get a vector for avoiding the traffic but this was not the case here. The same occurred again near Podgorica (LYPG) where I was already at 9000 feet. Before I reached POD VOR I was cleared direct to RETRA point which is border point between Montenegro and Albania. I had to switch to Tirana radar. Soon after the initial contact Tirana gave me alternate frequency in case of loosing contact. Obviously this is a standard practice due to very mountainous terrain in the eastern part of Albania. Later on, when I was approaching MAVAR point, which is the border point with Macedonia, I wasn’t able to communicate with Tirana any more so I had to switch to the alternate frequency which was the frequency of Skopje radar. They cleared me first to IZD (Ohrid NDB) and soon after that directly to Ohrid airport (LWOH). Ohrid tower gave me the chance to choose the approach over the Ohrid lake, which I used for my personal training of an ILS approach. After we parked and secured the airplane we took a taxi to the motel I have reserved via internet. First of all, the taxi driver charged us 10 EUR for a short ride of about 5 km. Because I know the prices in Macedonia from my previous visits I complained about that, however I finally paid. The second “surprise” was the motel – the room was under the roof and was far away from what they were advertising on the web. So we decided to call another taxi, this time from an official taxi company, and we asked the driver to help us to find a decent hotel. He suggested us to go to a new hotel owned by Macedonian oil company – Makpetrol. The hotel was excellent, very clean with a nice swimming pool and with a access to the private beach on Ohrid lake. The price was reasonable – 30 EUR per person per night with included breakfast. In the afternoon we were swimming in the pool and also in Ohrid Lake where the water was about 23-24 degrees Celsius what was excellent because the outer temperature was exceeding 30 degrees. In the evening we took a short walk along the coast of the lake. Next day we had to depart before 16:00 hours local time because the airport is working from 8.00 to 16:00 hours. We were the only airplane which departed that day from Ohrid airport. Despite this fact they were not willing to give us another departure slot unless I would pay extra fee. When we arrived at the airport there was nobody there so we had to stick around to finally get somebody who told us how we can clear the formalities. The police checked our passports and luggage and then I had to pay the landing and one overnight parking. Because they don’t have a lot of traffic they would like to squeeze every airplane. Our destination this day was airfield Stenkovec near Skopje where Aeroklub Skopje has its base. In order to get more money they tried to charge me for the international flight, but they didn’t succeed because the software didn’t allow them. I had to pay about 38 EUR for landing and one night parking. When I was checking the Macedonian AIP about the requirements for VFR flying in Macedonia I didn’t find any special requirements. However, my colleagues from Aerokolub Skopje told me, that I need a special permission to fly inside Macedonia. This permission is issued by Macedonian CAA to Aeroklub which officially hosts you. To obtain this permission I had to send them the scanned airplane’s documents and my license together with the medical certificate. My good friends from Aeroklub Skopje arranged everything for me and I got the permission few days before I entered Macedonia. 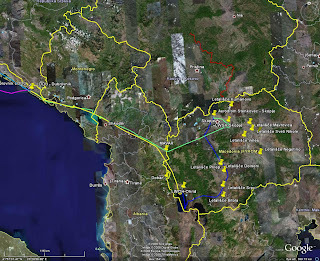 The route was: LWOH – Bitola – Prilep – Burek (intersection point) – Stenkovec. After departure from Ohrid airport we were flying along the coast of Ohrid Lake to the south until I almost reached the border with Albania and then turned back and crossed the mountains east of Ohrid Lake. We bypassed Prespansko Lake inbound to Bitola. On the south there was mountain Pelister, one of the highest mountains in Macedonia. The flight was pretty bumpy due to severe turbulence although we were flying at 9,500 feet where the outside temperature was about 15 degrees. We enjoyed the rough terrain north of Prilep. After Burek point we started our descent towards Stenkovec airfield where I was already flying in 2007. When we landed there the outside temperature at the airfield was 40 degrees Celsius. We were welcomed by the president and the executive manager of Aeroklub Skopje. They suggested that we put the airplane in the hangar as soon as possible and then we hurry to an air-conditioned restaurant in Skopje. While we had a very nice time in the restaurant several guys from Štip Aeroklub joined us and also a guy from ATC. It was really a very nice companionship and we had to exchange a lot of information. These guys are really great guys and they did their best to make my visit in Macedonia as pleasant as possible. Once again I had the privilege to be their guest and experience their ultimate hospitality. I sincerely hope that I will be able to welcome them one day in Slovenia. Next morning I had an appointment with my business partners in Skopje and after that Nikola, the executive manager of Aeroklub Skopje, transferred us to Stenkovec airfield. Landing and parking at Stenkovec was free of charge as they try to develop the general aviation in Macedonia. Nikola made a short movie about my departure which he published on YouTube. LWSK, former name Petrovec, is only 13 minutes of flying away from Stenkovec airfield. When we were landing there it was pretty windy with strong gusts so I had to use all my knowledge of landing in crosswind to safely land there. We cleared the customs and passport control and paid the landing fee which was bout 24 EUR, much less than at LWOH. It took only 40 minutes for all the formalities and refueling. The price of 1 liter of Avgas was about 1.7 EUR for foreign aircrafts what is a very reasonable price. 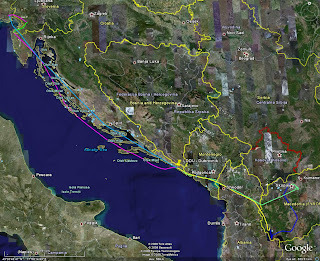 The route to Dubrovnik was simple: LWSK – MAVAR – RETRA – POD VOR – TZA NDB – TIBRI – LDDU. It was a windy day with a heavy turbulence also at FL300 to FL400. We climbed to 9500 feet inbound MAVAR and crossed the border with Albania. The clouds there were pretty low so I had to descend shortly after we entered Albania. I tried to contact Tirana but was unable to do so. Therefore I asked Macedonia radar to notify them that we are flying inbound RETRA point. After some time one airliner contacted me and he was relaying my message to Tirana. Due to the clouds we had to descend to 6000 feet. When we cleared the mountainous terrain there was no problem to establish a radio contact with Tirana. Few minutes before RETRA point I was instructed to contact Podgorica approach in Montenegro. However, they apparently didn’t receive my flight plan so I had to contact Tirana once again and ask them to resend the flight plan. This time they received it and we were cleared directly to TIBRI point after flying only a few minutes towards POD VOR. Due to the windy weather at Dubrovnik airport all the airplanes were using runway 30. After refueling any paying the landing fee we departed for Portorož in Slovenia (LJPZ). I am very ineterrested in your story,especially the part about Macedonia. We are planning a trip from Holland to Greece and have the intension to visit the Stenkovec Airport. 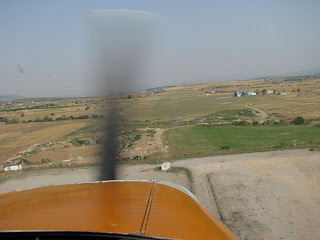 I contacted ( over the phone)the CAA and the man told us that there was no problem to enter and land in Macedonia (of course with flightplan). But there is a problem because it is very hard to get a VFR chart of the airspace of Maced. Do you have any suggestions for our trip?